Hume Cronyn, the versatile stage and screen actor who charmed audiences with his portrayals of irascible old men and frequently paired up with his wife, Jessica Tandy, has died of cancer. He was 91. Cronyn died of prostate cancer Sunday at his home in Fairfield, Conn., family spokeswoman Karen Connelly said Monday. He and Tandy were married for nearly 52 years at the time of her death from ovarian cancer in September 1994. The couple were honored at the 1994 Tony Awards with the first-ever Special Lifetime Achievement Award. 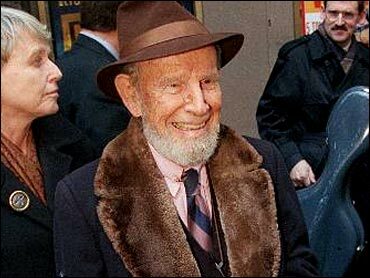 Cronyn, known to modern audiences for his roles in the 1980s "Cocoon" movies, was a seasoned stage actor, making his theater debut in 1931 as a paperboy in "Up Pops the Devil." He was known for his versatility as an actor, playing a wide variety of characters on stage, including a janitor in "Hippers' Holiday," in his Broadway debut in 1934; the gangster Elkus in "There's Always a Breeze," in 1938; and Andrei Prozoroff, the brother in Chekhov's "Three Sisters," in 1939. He made his film debut in 1943 as the detective story addict Herbie Hawkins in Alfred Hitchcock's "Shadow of a Doubt." After Cronyn appeared in Hitchcock's "Lifeboat" in 1944, a critic in the New York World-Telegram wrote: "Hume Cronyn is one of the most vivid young character actors to come along in Hollywood in quite a time." Cronyn went on to take other film parts, both major and minor, appearing in numerous movies over the next 50 years, including: "Phantom of the Opera" (1943); "The Postman Always Rings Twice" (1946); "People Will Talk" (1951); "Cleopatra" (1963); "There Was a Crooked Man" (1970); and "The World According to Garp" (1982). He was nominated for an Academy Award as best supporting actor for his performance in "The Seventh Cross" in 1944. Cronyn frequently worked with his wife — on Broadway in "The Gin Game" (1978), on television, in "Foxfire" (1987); and in movies, as a married couple, in "Cocoon" (1985) and "Cocoon: The Return" (1988). Both he and Tandy were Emmy Award nominees in 1994 for their performances in "Hallmark Hall of Fame: To Dance With the White Dog." Cronyn won the award for best actor in a miniseries or special for the CBS movie about an elderly man whose dead wife's spirit returns in the form of a dog. He won two other Emmys as well. He also won a Tony as supporting actor for playing Polonius in "Hamlet," a 1964 production of Shakespeare's play directed by John Gielgud. Cronyn, who often found himself playing curmudgeons, joked about his crusty image in a 1987 interview with the New York Post. "I don't mind playing absolute bastards — some of the best parts I've had have been heavies. I just don't want to play the grouch," he said. Cronyn also tried his hand at writing and directing. In 1946, he directed a production of Tennessee Williams' "Portrait of a Madonna," starring Tandy, and in 1950, on Broadway, Ludwig Bemelmans' "Now I Lay Me Down to Sleep." He co-wrote the television adaptation of "The Dollmaker," starring Jane Fonda, in 1985. Tandy once told an interviewer that Cronyn had a certain restlessness about him. "I find it very difficult just to sit. I would love to learn how to do that with contentment," Cronyn said in 1988. "I fill my life with a lot of `busyness' in between jobs. Then I work very hard. Some of it is quite unhealthy. It's compulsive. I don't know what to do about it. I'm a little old to change." On the set, Cronyn was known for being something of a perfectionist. Director Dan Petrie, who worked with Cronyn in "Cocoon: The Return" and "The Dollmaker," said Cronyn was meticulous about learning the idiosyncrasies of his characters. "Hume ... had to work out everything very, very carefully for himself — how he would sit, how he would wear a hat, should he wear a hat, should it be down over his right eye or over his left eye, should he wear glasses, should he wear suspenders ... all of those things were very vital concerns of his," Petrie said. "The mechanics of it, all of that was grist for his mill," Petrie said. "He very painstakingly built his character through the way he would dress, the way he would present himself." Cronyn conceded he could be somewhat persnickety when preparing for a role. "I do a lot of planning and plotting. That's my greatest weakness," he said in a 1984 interview. "If I'm not terribly careful, I'll plan to a point where it could come out cut and dried." Cronyn was born in London, Ontario, one of five children of Hume Blake, a prominent Canadian financier and political figure. He studied law for two years at McGill University in Montreal, but gave up a legal career for the theater. At McGill, Cronyn was an amateur boxer; he was nominated for the Canadian Olympic boxing team in 1932. Cronyn spent a summer studying under Max Reinhardt, a famous Austrian drama teacher and theatrical producer. From 1932 to '34, he attended the American Academy of Dramatic Arts in New York City. Cronyn leaves his wife, children's writer Susan Cooper Cronyn, whom he married in 1996. He also is survived by a son, Christopher Cronyn of Missoula, Mont., daughters Tandy Cronyn of New York, and Susan Tettmer of Los Angeles and stepchildren Jonathan Grant and Kate Glennon, both of Scituate, Mass, eight grandchildren and five great-grandchildren. Services will be private, Connelly said.